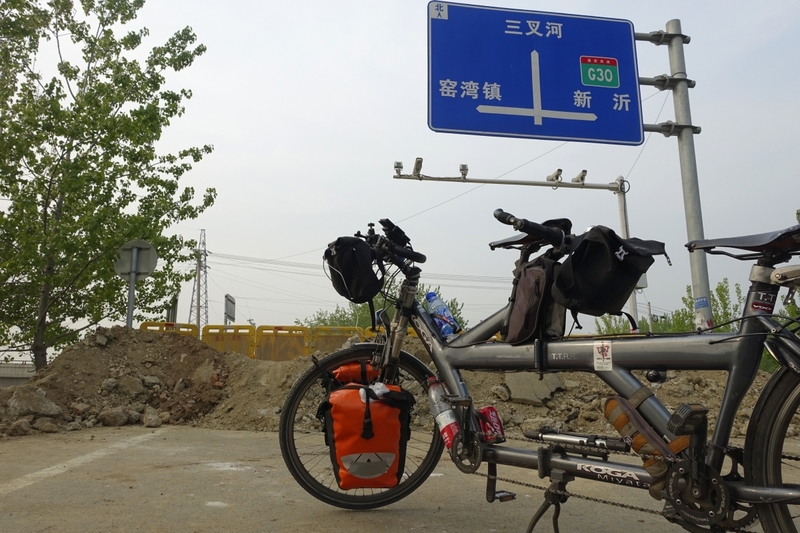 Before arriving in China I was bewildered by modern navigation systems and Google maps that could predetermine every road and every turn in our journey, leaving no room for spontanity and the unexpected. Reality proved me wrong. I am still unsettled by the fact that all those narrow village and field lanes we bike along in Jiangsu are displayed on our navigation system. It has, however, also lead us along newly built streets – so new, that the brick walls at the end of them had not yet been removed. It has directed us towards bridges, which were still under construction. We headed to hotels, shown on the Jiangsu road atlas, only to find out that the future hotels are still a hole in the ground. We have crossed or even biked along perfect broad roads, which, according to all navigations and maps, are non-existing. Like the new six-lane road below, which our field lane (narrow but existing!!!) crosses. 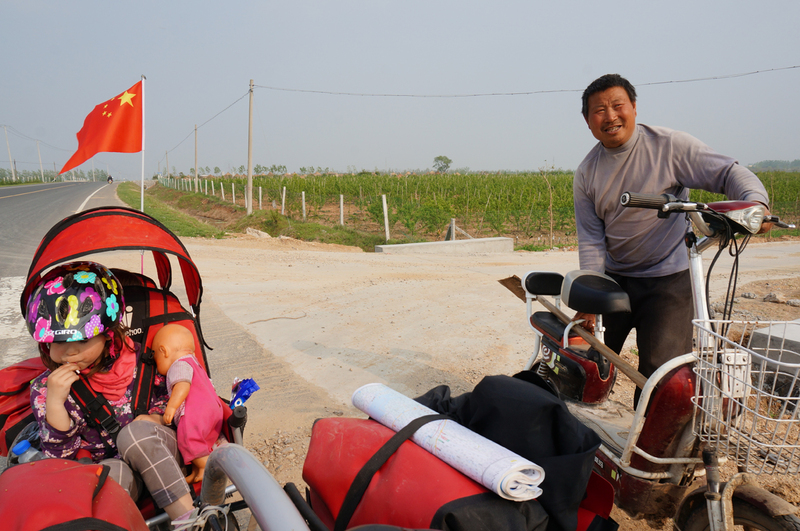 Merely one day of biking from the district city Suqian to the ancient town of Yaowan in Northern Jiangsu entailed a whole variety of surprises offered by the Chinese roads. That day we started late even for our standards. One of the major landmarks of the city – a monument devoted to the battle in Northern Suqian between the PLA and the Guomindang in 1946 ,- was just around the corner of our Hotel Verona and deserved a stop. And then we saw across the street the small Buddhist monastery of the Utmost Happiness, nestled among high-rises in different stage of completion. Like them, the monastery and the statues in it were brand new. 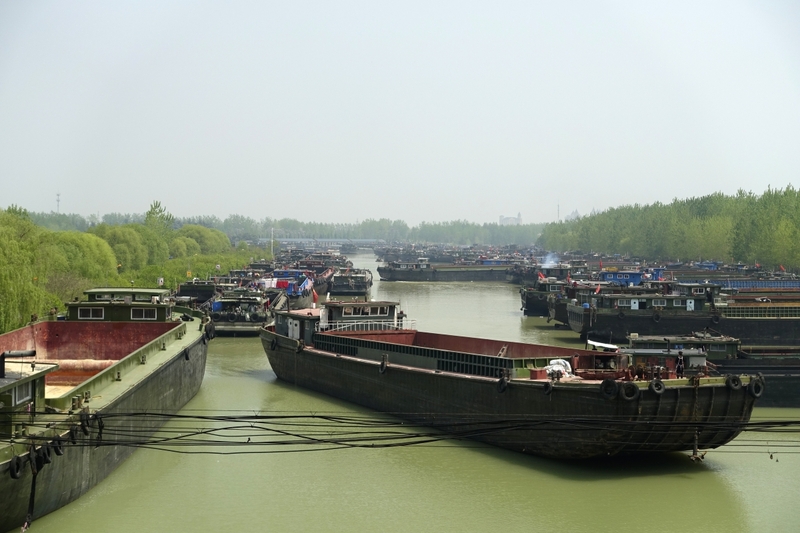 It is long past twelve when we are finally on the road, with an estimate of 65 km ahead of us, but we are optimistic, and even stop for a photo of the Grand Canal jammed with all types of barges. And then the problems start. According to the navigation a perfect straight road would take us out of town direction north, and further on for 30 km. The road though, after 15 km or so, turned out to be leading through a construction site. This time it wasn’t the usual high-rises, but a scenic area under contruction. Still it was done on the same grand scale: a golf-course was being laid, ponds and channels were dug, whole forests have been planted all at once. After 5 km of manoeuvring among trucks, bulldozers, piles of gravel and muddy potholes, Volker decided to make a small detour. West, then north, then east again, and we were supposed to hit the same road again, but past the construction site. At the end of our detour we were faced by a huge pile of earth, right beyond which laid our northward road: seen, but unreachable. Another detour then! This time it goes down west to the Luoma lake. Road signs point to Luoma lake scenic region, to a certain Peninsular Resort, but the lake is deserted and peaceful with no sign of hotels or restaurants along this stretch. We look longingly across the lake, where one can discern in the misty distance outlines of constructions on the opposite side. This is where we are supposed to go today. Volker has been hearing for some time rumours of the ancient water town of Yaowan, different, but no less picturesque than the water towns on Lower Yangzi. Being not so easily accessible, it lies out of the usual tourist itineraries. Yaowan is situated on a big peninsular between the lake and the Grand Canal. 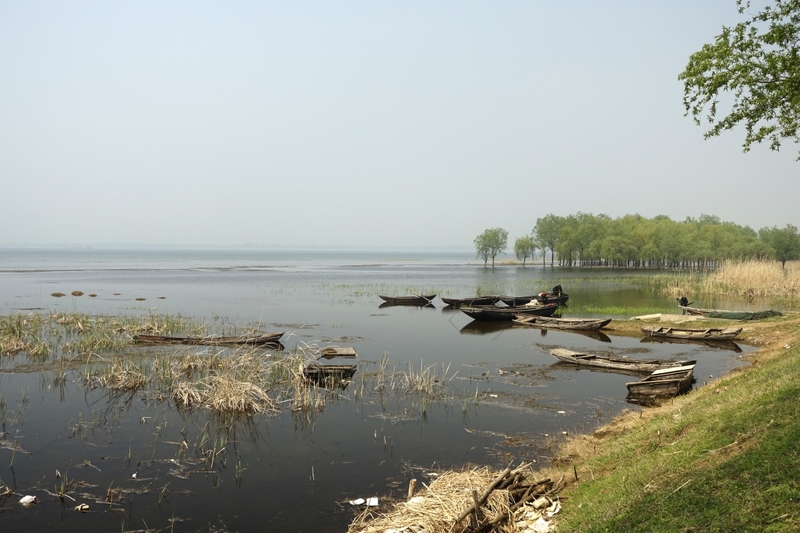 Although it is only 20-25 k across the lake from Suqian, there is no ferry service; and there is no road circumventing the lake. Reaching Yaowan for us means making 3/4 of a circle: 30 km north, then turning west for 20 km, then turning south for 15 km. We soon have to leave our shady road along the lake, pass by the construction of the new resort to which the road-signs starting from Suqian already pointed, and then we are faced with a choice – either the straight, but busy and uninspiring road northwards to Tangdian, where we have to turn west, or side-roads through villages, displayed on our navigation. We opt for the second option, still relishing the experiences from the day before. The lane along which the navigation leads us, however, starts to deteriorate after few kilometres, and deteriorates further on, until we are on an unpaved array of potholes among the fields. I get my first taste of mountain-biking, while the kids hopelessly scan the dusty surroundings for an ice-cream vendor. It is already 15:30 as we finally make it to the main road northwards, with still 55 km to go. Hopeless, we think. We just try to reach the next town, reward the kids with an ice-cream and reconsider our plans. 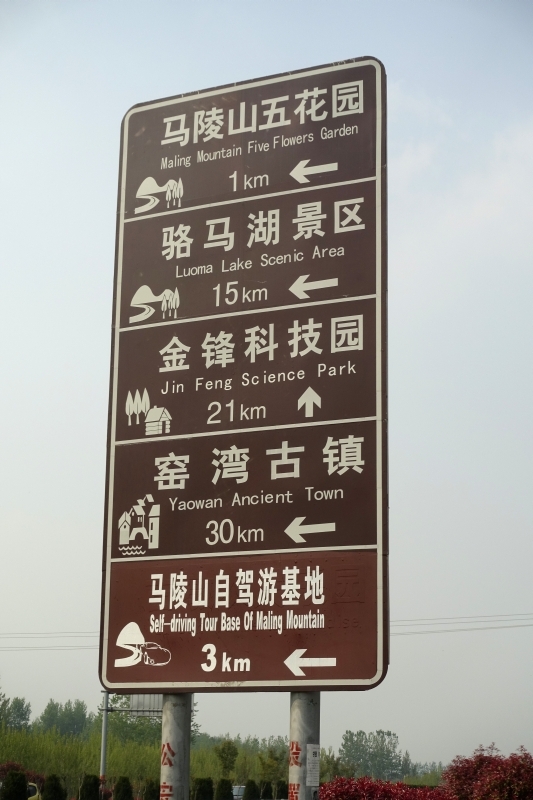 And then a miracle happens: A road sign looms ahead of us: Yaowan 30 km. And then even better: a brand new road branches direction west. 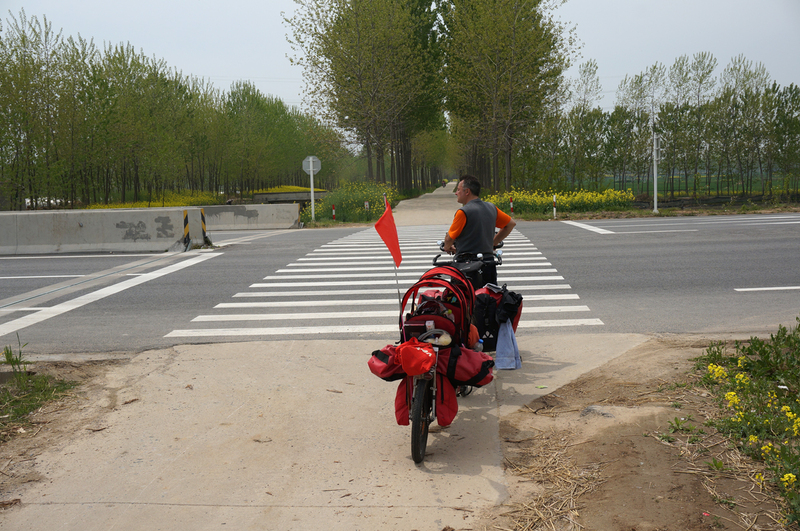 This 4-lane road is non-existing according to our navigation and to the 2015 editions of two Jiangsu road atlases. The phantom road takes us through the scenic area of the Maling Mountains, covered with vineyards and orchards. “Oberpfalz,” says Volker, reminded of his birthplace. Being non-existing has also the benefit of not being burdened by traffic. 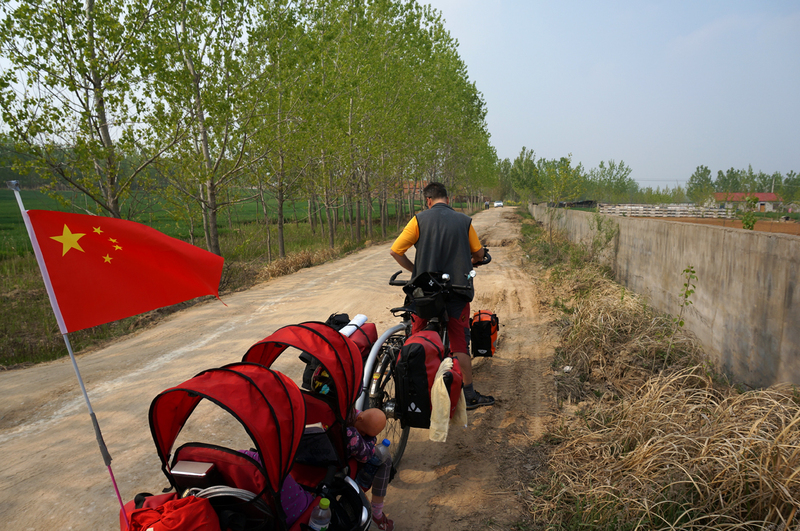 The road leads us to the other side of the Luoma lake, a road sign reminds us that for Yaowan we have to turn right and we already see a bridge ahead, when suddenly just where the road connects with the bridge an earthen barricade appears, for the second time today. Few cars have stopped before it, their drivers looking in frustration around. What now?! – no way to turn back as the dusk is quickly approaching. Luckily, the inventive locals have as always found their way around this obstacle: we watch as few pedestrians carefully tread along the edge of the ridge round the barrier, and an electric motorbike is squeezed through. Where a motorbike can go, we can go too! – Sarah and Nora quickly disembark and after some manoeuvring we are on the other side, with the wide bridge stretching ahead of us. Of course, this bridge is also non-existing. And what a feeling it is, swishing down through the empty and non-existing! The reality of these non-existing roads and bridges, however, causes doubts about what lays ahead of us. The only place they lead to is the Ancient Town of Yaowan, and nobody constructs such perfect roads to a forgotten-in-time, non-touristic village. But the rural countryside around us gives us some hope: 8 km to go and still fields, no construction in sight; 4 km to go: still fields; 2 km to go: the first construction appears – a huge visitors’ centre and parking space. We arrived a year too late!